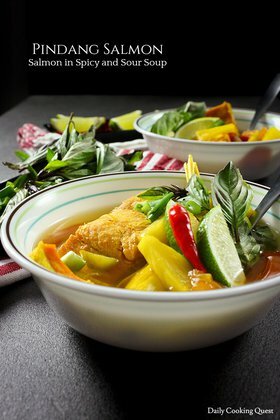 Most Indonesian live within walking distance to a Padang restaurant no matter where we live in the nation, so even for a non Padang descent like me, most will be very familiar with the dishes. 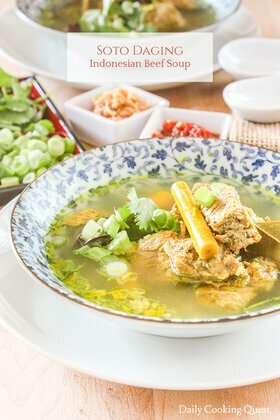 As with many other cuisines, Padang has its own distinct soto (soup dish), which is just as refreshing and as delicious as many others throughout the nation. 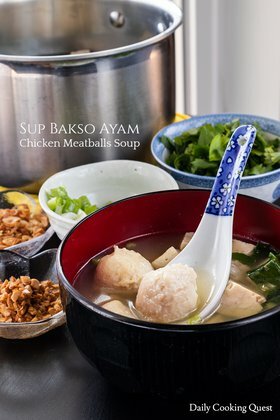 Soto Padang is always served with perkedel kentang (potato fritters), so if you are in the mood to prepare soto Padang at home, it will be a great idea to also set aside the time to prepare some perkedel. Boil together beef, water, and all the spices for soup stock. Reduce heat, cover, and simmer until the beef is fork tender, about 2 hours. Remove the beef, thinly slice, set aside. Strain the soup stock and return the strained stock to the pot. Heat 4 tablespoon of oil in a frying pan and fry the beef slices until browned. Set aside. Heat 3 tablespoon of oil in a frying pan and sauté spice paste until fragrant, about 5 minutes. Add the spice paste to the soup stock along with galangal, bay leaves, kaffir lime leaves, cloves, star anise, salt, sugar, and ground white pepper. Bring to a boil, and simmer for another 15 minutes. Heat oil in a frying pan and sauté chilies, shallot, salt, and sugar until fully cook and fragrant, about 5 minutes. 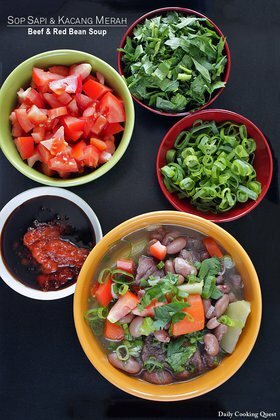 Place some glass noodles and fried beef in a soup bowl, and top with the soup. 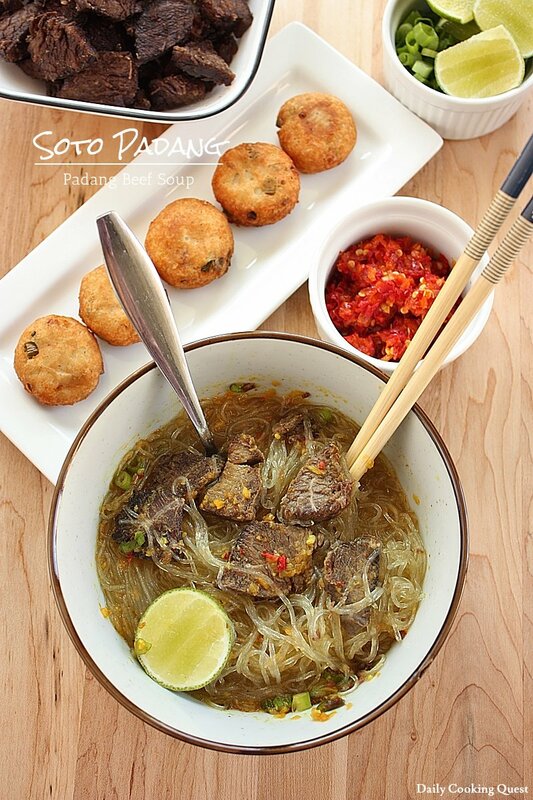 Serve with perkedel kentang (potato fritters), chili sauce, scallions, fried shallot flakes, and lime wedges.